A study at the University of Tübingen highlights the intricate nature of visual responses – findings may help to improve digital cameras as well as visual prosthetics. Our visual abilities are astonishing: We can see in extreme situations, from a stroll under the starry sky to a ski-run in glaring sunlight. We do this effortlessly, much smoother and more stable than even the most modern digital cameras. Scientists knew that the first steps of visual processing already occur inside our eyes: The retina does not only harbor the light-sensitive receptor cells, but it also processes the incoming information and transmits it as an intricate pattern of activity via the optic nerve to the brain. A new study now shows that this process is much more complex than previously thought. 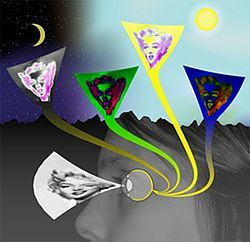 Scientists of the Werner Reichardt Centre for Integrative Neuroscience (CIN) and Bernstein Center for Computational Neuroscience at the University of Tübingen, together with colleagues from the University of Manchester, showed that the activity patterns sent to the brain – the “language” of the retina – fundamentally depends on the ambient light level in our environment. When light conditions change, the retina speaks a different language. The study was published on 8 Dec 2014 in the journal “Nature Neuroscience” (DOI 10.1038/nn.3891). “So far, scientists assumed that the retina will always convert the same scene into a specific pattern of activity,” says Thomas Münch from the CIN. However, he and his co-workers from the research group “Retinal Circuits and Optogenetics” found that the retina sends very different information to the brain as soon as the brightness changes only marginally. The observer sees the same scene, but the nerve impulses are fundamentally different. A better understanding of these events might contribute to improving digital cameras and other technical equipment, and to making visual prostheses more efficient. “Our results force us to rethink how our eyes, and vision in general, work,” says Münch. They show how complex the visual system is, even the first steps of vision inside the retina. This also raises new questions for the scientists: Why is the language of the retina changing at all? How can our brain nevertheless always recognize the same image?